○ Survey Content: The current state of performance facilities, including basic and general conditions, personnel, finances, performance showings, etc. Organized by the Ministry of Culture, Sports and Tourism(Minister Kwang-shik Choe) and Korea Arts Management Service(President Jae-wal Jung)․The results of the 2012 Survey for the Present Condition of the Performing Arts(Performance facilities as of 2011), supervised by the aforementioned, were released. The 2012 Survey for the Present Condition of the Performing Arts examines the operating conditions of performance facilities, an essential distributing agent in the performing arts industry, through objective and reliable methods․The results of the analysis are included. In the Survey for the Present Condition of the Performing Arts and the following analysis, performance facilities are categorized by their characteristics as a facility. Government facilities, arts and culture halls, and other public facilities are categorized as public facilities. Daehangno facilities and other private facilities are categorized as private facilities. 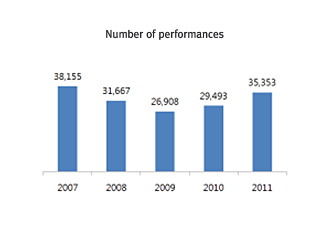 The scale of the domestic performing arts industry in 2011 can be measured in the 868 performance facilities, 10,039 industry personnel, and the estimated 316.7 billion won in sales, based on sales figures for the facilities. Compared to the previous year, the number of facilities and personnel increased by 5.9% and 4.3%, respectively, while sales decreased by 3.3 percent. Examining performance facilities by facility type, it’’s possible to observe that general private facilities and art and culture halls take up a dominant proportion of the total performance facilities. In terms of number, the number of general private facilities took up the largest percentage, making up 36.9% of the total number of facilities. Art and culture halls demonstrated the highest number of personnel, with 42.3% of the total personnel, and the general private facilities had the highest proportion of earnings, earning 39.5 percent of the total sales. Overall, central government facilities and art and culture halls had a higher proportion of personnel and sales per facility, while the Daehangno facilities demonstrated a lower proportion of personnel and sales per facility. The general public facilities had a relatively lower proportion of sales for their number and personnel, and the general private facilities had a relatively lower proportion of personnel for their number and sales. 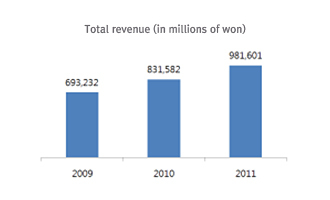 In 2011 the total revenue of performance facilities was 981.6 billion won, an 18% increase from the previous year, and the total expenditure was about one trillion won, a 6.9% increase from the previous year. Examining the data by facility type, the proportion of public facilities, including government facilities, art and culture halls, and general public facilities, made up more than 80% of the total. Of this number art and culture halls took up more than 50% of the total. 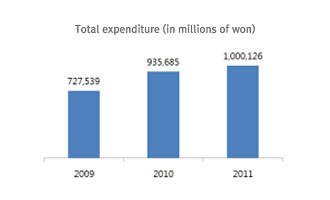 Private facilities such as Daehangno facilities and general private facilities demonstrated a slightly a higher proportion of the total expenditure to their relatively lower proportion of the total revenue. 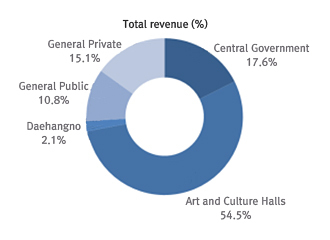 Examining the proportion of revenue by category, public facilities such as central government facilities, art and culture halls, and general public facilities demonstrated a higher proportion of public funding, while private facilities such as Daehangno facilities and general private facilities demonstrated a higher proportion of independent revenue. 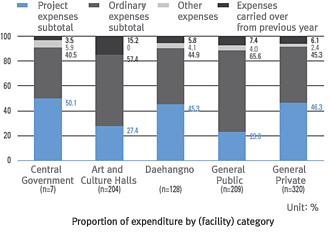 By type of expenditure, central government facilities, Daehangno facilities, and general private facilities demonstrated a mostly equal proportion of project expenses and ordinary expenses. Meanwhile, art and culture halls and general public facilities had a higher proportion of ordinary expenses in comparison to their project expenses. There were 35,353 performances in 2011, a 19.9% increase from the previous year, and 100,015 days of performances, a 19.2% increase from the previous year. Performances were staged a total number of 138,878 times, a 30.9% increase from the previous year, and the audience totaled to 30,264,504, a 27.3% increase from the previous year. In the number of performances and audience members, art and culture halls took up 35.5% and 33.0% of the total in each respective category, making up the highest proportion in each category. In both the number of performance days and the number of times performances were staged, general private facilities took up the highest proportion, at 33.6% and 34.7% of the total, respectively. 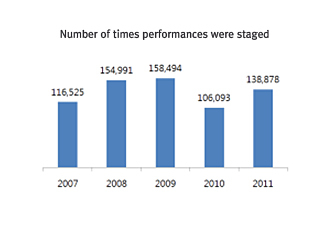 Overall, central government facilities had a relatively higher proportion of audience members to their number of performances and number of times performances were staged. 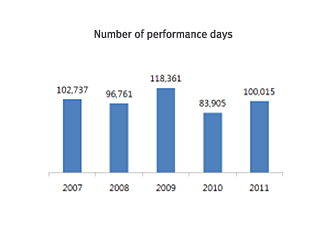 Art and culture halls and general public facilities had a relatively lower proportion of performance days and times to their number of performances and number of audience members. Daehangno facilities demonstrated a relatively higher proportion of audience members, number of performance days and number of performances staged to their number of performances. Finally, general private facilities had a relatively lower proportion of audience members to their number of performances, number of times performances were staged, and number of performance days. Examining the number of performances by genre, central government facilities, art and culture halls, and general private facilities had the highest proportion of Western music. Daehangno facilities had the highest proportion of theater performances, and general public facilities had the highest proportion of multi-genre performances. 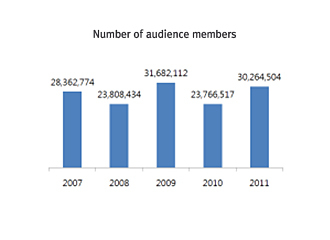 Examining the audiences, general private facilities, at 59.4 percent, had the highest proportion of musical audiences. Central government facilities showed a higher proportion of Western music performances, and Daehangno facilities showed a higher proportion of theater performances, compared to other genres. The 2012 Survey for the Present Condition of the Performing Arts (Performance facilities as of 2011) has a margin of sampling error of ±5.6% points, at 95% confidence. A Report on the Present Condition of the Performing Arts, including the above, will be distributed in October 2012 at regional performance halls, art and culture halls, and other relevant institutions.